One-Minute Summary: We, for one, are very glad October is over. See below for what we think has gone on. When all markets correct, we usually find it’s a good idea for the dust to settle and see what has fundamentally changed. As we’re fond of saying, prices change more than facts and the last few weeks have seen investors hitting the sell button and asking questions later. The markets finished higher for the week but still had one of their worst months for some time. Earnings were phenomenal with the weighted average growth rate at 24%...that’s up from 19% a week ago but that's what happens when big index weightings like Google, Apple and Facebook turn in 30% to 40% growth rates. The market looks very oversold to us. Expect healthier markets once November elections are done. 1. Look back in anger: October was not kind to investors. The S&P 500 was down 7%, small caps down 11%, the Dow Transportation down 8%, the NASDAQ down 8% (and at one point down 12%), most Asian markets down 9% and most European markets down 8% to 9%. The best performing market was Switzerland, down 0.5% and the worst Korea, down 14%. The first is all about haven status and the second is a bellwether for global trade. Was it better in bonds? Yes, but still negative. The U.S. broad bond market fell 0.9%. U.S. corporates and High Yield and international bonds were down nearly 2%. The best bond market was German Bunds where 10-Year yields fell from 0.5% to 0.3% but that was all a flight to quality as Italian spreads widened out. Now what does it mean when all asset classes are hit? A few misplaced remarks. In this case, renewal of the China tariffs and Powell’s hawkish talk on the natural interest rate. A few missteps on the geo-political stage. In this case, the killing of Jamal Khashoggi, with all Saudi oil market at risk and the midterms, which are, you know, different. A few highly leveraged trades. 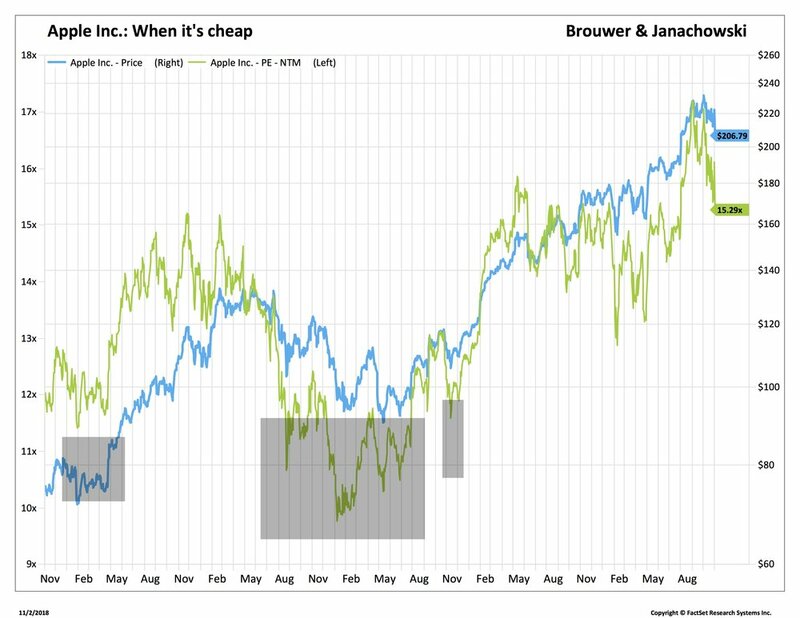 In this case, U.S. tech index, which had been a no-lose proposition all year. A few missed earnings. We already mentioned companies like CAT and MMM which narrowly missed revenue or earnings, or cautioned on the 2019 outlook. A few missed economic numbers. In this case, ISM manufacturing, trade, capital goods. No “Fear” trades. In this case, markets did not head to the classic safety trades of gold, yen, Bunds and T-Bills. So, it wasn't a move from “risk to safety” but a general rout. Company earnings: are strong. They're near the peak but that means they won't grow as much, not that they're about to swan dive. Corporate repurchases will start again soon. Economy: also strong. Low unemployment and low inflation. But the twin deficits (trade and budget) are about to get worse. That’s a concern not a disaster. Leverage: in some areas like leveraged loans and High Yield. But not really in banks, consumer (yes, we know the student debt story). Corporate America: not happy with import prices and uncertainty (see some of the comments in the latest ISM report here). But also still moving ahead, not shedding labor (quite the opposite) or reducing capacity. Slowing growth: the economy can not handle 4% growth and S&P 500 companies can not turn out 20% earnings growth year over year. That’s an adjustment not a hard recession. And it’s generally good for bonds. Monetary policy works with a 12-24 month lag: the increase in rates in the last 12-months is now showing up as a slower economy. Slower, not stopped. We put all those together and would expect more volatility…as we've said before, volatility was way too low in 2017 and most of 2018….what we have now is normal. The numbers will change very quickly. Two days ago, we had a YTD performance of the S&P 500 of 1.4%. Today it's 2.5%. Once we get through this month we fully expect quieter markets and Treasuries to steady. We’re fans of history so we’ll use that as an excuse to pull out an important chart. For the last five years, a 60/40 equity to bond portfolio returned 6.5% or 70% of the S&P 500 but with 40% less volatility. Longer numbers give an even better trade off. Market volatility may produce opportunities for tactical traders but preservation of financial and mental capital is more important in our world (h/t Cameron Crise). 2. Jobs. The October jobs numbers were going to surprise because the last two months saw hurricanes that distorted the numbers. The way the BLS calculates the people in work is to ask, “were you paid anything last week?” If you weren’t, you're not counted as employed. This is fine if you're paid semi-monthly or monthly. There is no change to the numbers employed. But it's different if you're paid hourly. If you miss a few days because you’re trying to get out of the way of a storm, you fall off the payrolls. If you then come back to work the following week, it counts as a new job. It sounds confusing but what it means is that the new job numbers tend to score first, lower and then higher than trend in the months around hurricane disruptions. We think the trend growth in employment is around 200,000 a month so at first this looks like a continuation of a trend rather than a break to new higher levels. Labor participation rose a little, but as we wrote last week, it’s not about to hit any new highs. The one data point that caught the press’ attention was the white line, showing Average Hourly Earnings up 3.1% over the year…the fastest wage growth since 2009. That blue bar is the real increase in wages and benefits. Sometimes it goes up not because employees are paid more but because inflation dropped. As we mentioned before, there are lots of ways to get a pay increase but the only one we’re really interested in is if compensation grows significantly higher than inflation. It hasn’t. Look, nothing here is going to change the Fed’s mind about December. Some even think the Fed may raise rates at their next meeting on November 7th. The tradition of only announcing rate increases when there’s a scheduled presser is new…we remember the days when the Fed opened its doors at 8:30, told you what the rate was and closed up. But, no, they’re not going to do anything on election day. We're all set for a December meeting. A big equity market correction…more than 20%. Politics (the President rattles Mr. Powell). A big international event, say, an Emerging Markets melt down. Which is another way of saying, it ain’t gonna happen. 3. Peak Apple: No, probably not. Yes, it lost its $1tr market cap (so did Amazon but by a much bigger miss) but it's still up 22% this year, earns a 40% return on equity, and will spend around $100bn in share buybacks, which is enough to buy any of 450 companies in the S&P 500. Those of you so inclined will note that it has been a great timing investment when it falls to 12 times earnings (shaded area) but it's not there yet. Bottom Line: As last week, we would still look at protecting the portfolio where we can and invested in Treasury FRNs. We think there will be some restoration of confidence in coming weeks and would expect the bond market to stabilize and recover first. One-Minute Summary: It’s difficult to pinpoint the catalyst for the market sell-off this week. Most of the culprits were known for weeks. Trade, China, rates, tech problems, October seasonals. We knew all that. No central bank said or did anything they hadn't said already. So what was it? We'd point to two factors. One, technical. There are plenty of algorithm strategies. They see a price break and start dumping stocks to protect the positions. So, when Nasdaq broke its 200-day moving average on Wednesday, a lot of trading strategies kicked off. Don't expect great numbers from quant or hedge funds this year. Two, rates. Tuesday was also a day when the U.S. Treasuries fell. There were some big Treasury auctions that didn't help. But markets panic when investments meant to move in opposite (stocks and bonds) directions start tracking together. Treasuries rallied later in the week so normal service resumed. We'd also point out that our own “Fear” measures (gold, Yen, Swiss Franc and the 2-Year Treasury) barely moved so this wasn't a wholesale rush to safety. We think most of the recent 25bp increase in the 10-Year Treasury is catch up. It was clearly over sold and the rally on Friday brought that back to only a 10bp increase. Many investors have played the inverted yield curve story…that, yes, short rates would increase but longer rates would remain anchored because the economy was going to peak soon. We feel that's broadly true but the 10-Year hadn't moved enough to adjust. The economy, after all, will probably grow around 3% this year, which is close to its 70-year average. Yet Fed Funds are at their lowest since 1964. There was no major economic data. Inflation came in low and consumer confidence dipped a little. We would not consider either relevant to the week. 1. How can you tell if the market is overvalued? You can't. Sure, you can say that valuations seem high by standards like the CAPE Shiller ratio, Price to Book Value, Tobin’s Q, yield, narrow leadership or any number of metrics. None are thoughtless. None infallible. One may be very good at calling an overvaluation but, as we've pointed out in our recent “16 Lessons” blog, being right and early is the same as being wrong. What we try to do is balance out the risks of being in a successful, but perhaps long-in-the-tooth bull market, with diversification and protection. Clients know we’ve been investing in structured notes recently, and while they take a few years to mature, they at least put a band around performance results. The black line is the 60/40 portfolio. Above it is the S&P 500 and below it a widely followed bond index. As one would expect, the 60/40 portfolio weathered the severe draw-down in the two (shaded) bear markets better than a stock-only portfolio. Mind you, twice in the last 20 years, stock-only investors were enjoying some spectacular highs in 1999 and 2018. But the 60/40 portfolio has done very well and we'd expect it to serve investors well. Back to the vexed question of valuation, one set of data that has been a useful guide is the real earnings yield. It’s not complicated. It’s the reciprocal of the widely used price earnings (PE) measure deflated by the CPI. Stocks should return more than bonds because they're riskier. We can define a return to shareholder as the company’s earnings divided by its value...the earnings yield (above at 6.36%). But because we want real returns from stocks (bonds provide the nominal returns in our portfolios), this needs to be adjusted for inflation (above at 3.65%). We can also compare that yield of 6.36% to the 10-Year Treasury but it gives the same answer. Stocks were expensive for most of the 2004-2006 period and very cheap in 2011-2012. So where are we now? Stocks are not cheap but they are certainly not in the danger territory where the black line is below 3%. That fits with our opinion for most of this year. We think stocks still have some upside. After all, earnings are in good shape, the economy thriving and the Fed’s actions, while tightening, are predictable. We do, however, expect some of the quality and dividend aristocrats to perform better than some of the high-growth names (step forward FANG gang) that recently rolled over. So two things stand out. One, last week’s price action was big. We've only had daily price swings of that size four times in five years. But, two, note the shaded area. That’s 2017, when stocks had a strong year, up around 20%, with no set back. It was about as calm as we've ever seen. Compare this to the same chart using the halcyon days of the 1980s, when the market powered ahead by 150% in six years. That was a period of falling rates, strong earnings and reduced political risk. Not much to worry about in hindsight. Yet, the daily swings were much greater. In the last five years, the average daily move was 0.04% with a standard deviation of 0.77 (in other words, it would vary most of the time from down 0.74% to up 0.81%). In the ‘80s it was 0.06% and 0.87, which was 13% higher. The reason that we've had such low volatility is mostly down to interest rates being low. Stocks had no real competition. Now they do, especially as U.S. rates are increasing. The week was also notable for how nearly all stocks were caught in the sell-off. Last week, only 19 stock were positive and most of those were stocks that had an awful year-to-date performance, so were more in the nature of a short-term bounce. Followers of this note know we've argued that we’re in a higher volatility regime. Certainly higher than we've seen but not unusual in stock market history. Bottom Line: Fundamental buyers should return soon. Some will like the new prices and some will rebalance portfolios. Earnings will take most of the news flow. There are still 470 companies to report in coming weeks. We would still look at protecting the portfolio where we can and are currently looking at Treasury FRNs.